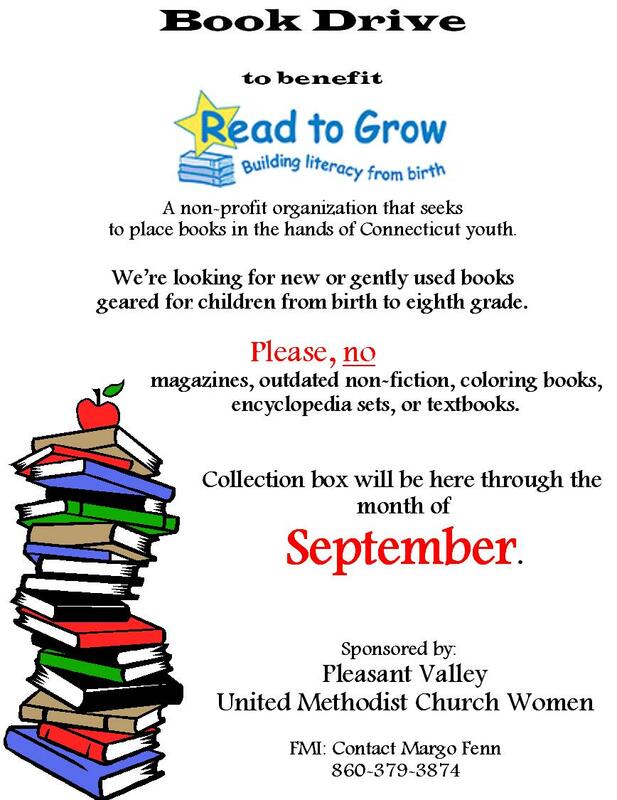 The book drive, sponsored by the United Methodist Women, to benefit the Read to Grow program has begun! Collection boxes are located at Pleasant Valley United Methodist Church, at the Barkhamsted Town Hall, the Barkhamsted Senior Center, and at the New Hartford Senior Center. New and gently used children’s books, geared towards kids from birth to 8th grade, will be collected. Perhaps over the summer months you’ve cleaned out your children’s book collections, or perhaps you will see some books at a tag sale during the coming month. Please consider dropping off your donation at one of the locations above to help with this initiative. Read to Grow is an organization that recognizes that children begin to learn from birth and that their first teachers are their parents. Read to Grow helps put books into the hands of parents and caregivers, as well as day care centers or other places where children are found. All books collected will stay in Connecticut. For more information, please check out their website at http://www.readtogrow.org.